Don't get me wrong - I love paper with an undying passion. But I'm trying to use it in smaller doses, particularly when it comes to wrapping gifts. There's something about a big pile of crumpled wrapping paper that makes me feel sad. 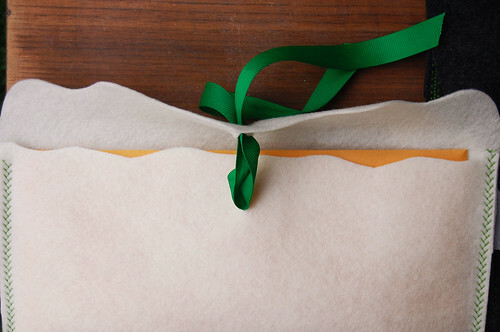 This year almost everything is wrapped in felt. Mostly because it's the easiest fabric to work with - easy to cut, no need to hem all the edges, and very sturdy. Making the pouches is easy. You basically just act like you're going to wrap the item, but you use cloth instead of paper and you run little seams down the edges. Make sure to leave a flap open so you can slip the item in and out. 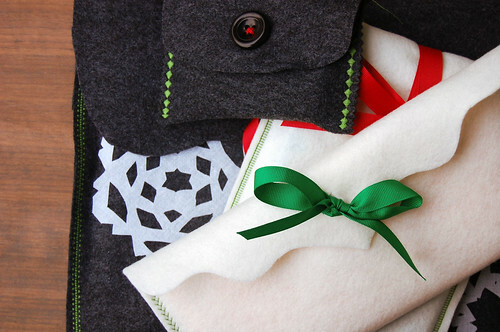 You could design these lots of different ways, depending on your sewing skills. I used some of the fancy stitches on my sewing machine, but you can also handstitch with some thick embroidery thread and it will look just fine. Some of mine close with a ribbon. I just cut a slit in the folded over flap and then sewed a ribbon to the front of the package. To close, you just pull both sides of the ribbon through the slit and then tie a bow. Others close with a button. Again, you cut a slit in the folded over flap and then you just sew a button to the bottom half of the package. The goal is to have them in a variety of sizes and use them every year. They actually take up a lot less space than a jumble of wrapping paper rolls. They work best for grown up gifts like books, CDs, DVDs and jewelry, which happen to be the kinds of gifts I give most often. These are genius. If only my family wasn't scattered every which way across the country.... I guess the packages could become a part of the gift. i love this idea... i wish i was crafty enough to pull this off! genius! I must try this! oh my goodness you are just too cute and creative! i hate looking at all the crumbled wrapping paper too! How very creative! But was it a lot more expensive than the paper? here you are back with more genius gift packaging ideas. you should sell these on etsy too! brilliant. and pretty, to boot. seeing the heap of crumpled pretty paper makes me feel a little depressed too. this is a beautiful solution. Again with the genius! Here I am, trying to figure out how to wrap a video game for my dad, and you come along with your felt envelope idea. Goodness knows I have a TON of felt left over from ornaments last year, and I have some ribbon, too. Thanks for the how-to! i am beyond impressed with your patience...i barely even wrap my gifts! these are so pretty. this seems like such an obvious idea--but i have obviously never thought of it! so simply lovely in its very own way and i adore it! great idea! what a wonderful idea!!! thank you so much for sharing with us. I lub felt for wrapping, though my creations lack such lovely stitching. That sewing machine has proven itself splendid! What an absolutely wonderful idea! This is the most beautiful of wrapping. Looks like it makes the gift extra special. Even better than paper. As far as cost goes, I actually think I'll come out way ahead on this one. Felt is fairly inexpensive (I went to my favorite fabric store and had it cut off the bolt, because those little felt squares you get at the craft store are not only small, they're also pretty poor quality felt) and since we'll re-use these every year and I'll probably end up making just one or two more each year, we won't need to buy wrapping paper. Time wise, same thing. I spent a day making these to wrap all our gifts this year, but when we wrap next year it will just be a matter of slipping gifts into the felt wrappers. We have a pretty good range of sizes, so I think they'll work for almost everything. Rachel, this is such a good idea! You've inspired me for this year as I think I have some good felt that would be just the ticket for such a project! This is a great idea! I'm completely excited to try this out the next time I give a gift. Thank you so much for sharing. This is the best paper-free wrapping technique I've seen! All my gifts are already wrapped (in recycled kraft paper), but I'm definitely bookmarking this for next year. Thank you! I hate throwing out all that paper too. Last year I made reusable fabric Christmas bags & turned paper shopping bags into gift bags. Looks pretty & is better for the environment. 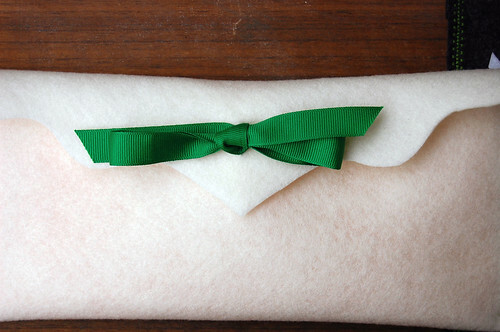 This is such an elegant and beautiful way to wrap gifts! These are dashingly beautiful, and I am sure the recipeint will love to use them again and again! These are great! You do such good things! These look very sweet. Great idea. I think it would be difficult to wrangle them back off the present recipient owing to their cuteness. But then I think perhaps they would use them to wrap a present in the future and less paper would still be being used overall! This is such a great idea! My best friend did fabric wrapping this year, and it looks so much fancier than holiday foil snowflake wrapping paper ever could. L-O-V-E this! I will jot it down in my holiday notebook and try this next year. I agree on the use of all that paper. This is fabulous. so very impressive. lovely work! GREAT idea. Makes even an "unthoughtful" gift like a gift card more thoughtful. Will definately do this next year and even for birthdays coming up. Thanks for sharing! this would be great way to make gift cards a little more special. That's a great idea! You don't mind if I do that do you? I have a lot of leftover felt from old school projects of mine and my brother that are collecting dust in a box. :) Thanks for sharing! They look amazing! wish I had seen this earlier. The pouches are reusable and look too cute! Your felt bags are so chic. Awesome! I'm going to have to do this next year. Bravo! I hadn't thought of putting the gift in the felt as if it were paper. 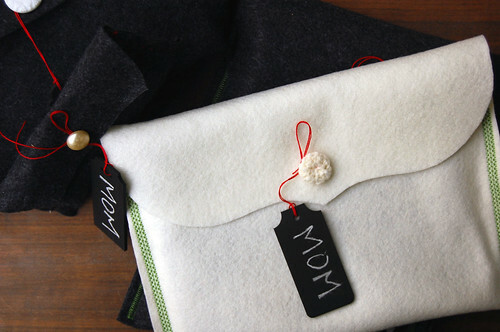 It makes so much sense to make custom-sized pouches for each gift. I write a blog about gift wrapping (www.thegiftedblog.com). Would be alright to share your idea? I'll either link to it or write a post about it if it's alright by you. What a great idea - and your photos are so beautiful! I was just in the fabric store yesterday and saw that felt was on sale... I thought to myself - if only I knew what to do with it... Well, I guess I'll be going back to get some! Thank you for sharing! Hi again - great! I look forward to writing about these - likely at the end of February or so. (I know, I'm a planner...) Thank you again for posting about this - I am enjoying perusing your blog!